Wilson swears he was not going to hide this meat in my underwear bin. Meet Wilson! 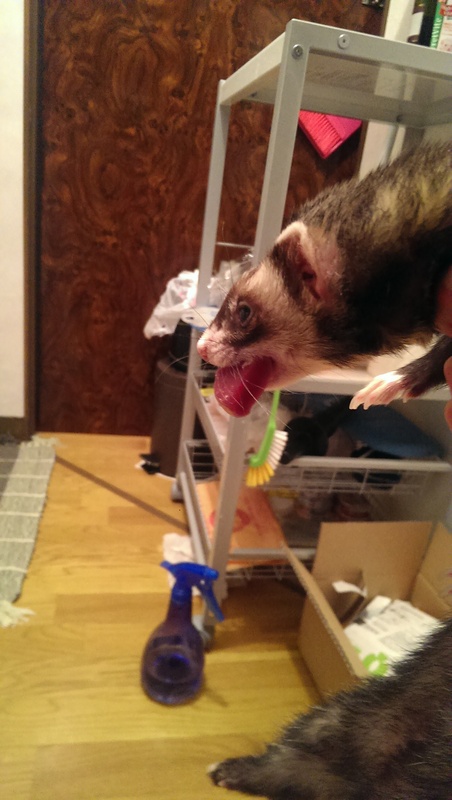 He’s a small ferret boy approaching seven years old. He and I have worked for his entire life to get him on a healthy diet and he has fought me every step of the way. We started when he was a baby on Marshall’s ferret food (please, never feed this food or any Marshall product to your ferrets!). It was weeks before he would accept ferretone-tinged Marshall’s food. Then it was weeks before he would eat any kibble shaped differently from Marshall’s food. Months followed before he would eat all his dinner without leaving the different flavored ones behind. Five years after he came home with me I finally succeeded in getting him to eat some duck soup (which was actually boiled chicken), and now, six years of living together and he is finally on a whole prey raw meat diet. Here is what I feed him and his girlfriend of five years, Amber CTB. Their main diet at the moment consists of whole, pureed, raw quail. I throw it bones and all into my new Vitamix and spin it on high for about 30 seconds until it comes out pink and smooth. Often I will supplement with chicken skin or organ meat as my guys are pretty old and need the extra calories and protein. I admit, I gagged a little the first time I made it, but now it’s no big deal to me. About two months ago I started mixing up chunks of raw quail into the soup in the hopes that they would accidentally get in the weasel’s mouth, and then he would have to eat them. Luckily this strategy worked. I remember the night I woke up to hear happy weasels crunching on quail bones. 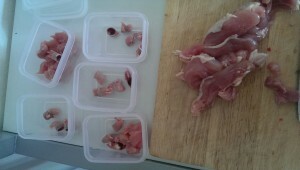 Once I had both of my smalls eating the whole meat pieces I stepped it up and added in pink mice. Weasels need a variety of meats to get balanced nutrition. I’m not sure how much variety is necessary, but in any case I found a reptile supply shop that sells individually frozen mice of all ages, so I order two tiny bags of small sized pinkies. Knowing Wilson, if I threw this little guy into his meat dish straight up he would carefully eat around it and it would just go bad, so I had to be sneaky. The first ten mice went into the blender with their quail. The eleventh mouse got cut in half and mixed into two separate servings of meat. Poor Wilson had no idea he was eating whole mouses! A few weeks later, I stepped it up to two pinkies per regular serving of meat. 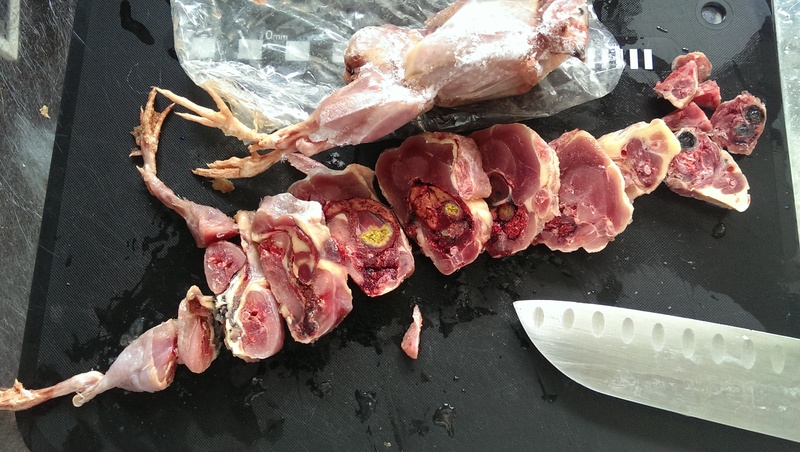 In the most recent menu, one serving of meat includes about 45% whole quail, 45% chicken thigh and skin, and the last few pieces are baby mice. I divide up the meat and put one day’s worth into these tiny 80mL containers and refreeze them after they’re cut into Wilson-won’t-hide-this-in-my-underwear sized pieces. When I serve it, I put it in a small dish submerged in hot water and ladle soup over it. It only takes about five minutes in the water to get warm enough for my little things to find it appetizing. One container of meat and about three teaspoons of soup is all they will eat in a day right now, so that’s what I put out for them. I have to say it is a lot of work to feed raw. It’s incredibly rewarding, though. Wilson and Amber have never been plumper despite their age and Amber’s recent health issues. I love being in control of my babies’ nutrition, too. I had searched all over looking for dry food that was ferret appropriate, but ultimately I came to the conclusion that no commercial product actually respects the obligate carnivorous nature of the ferret, along with their incredibly short digestive system. Pricewise, at the moment it is definitely more expensive that dry food, too. Probably about 50% more. 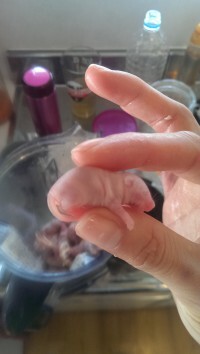 But ferrets are tiny — 80 mL of meat for a meal! — so it’s not really a financial burden at all. More the time factor, really. 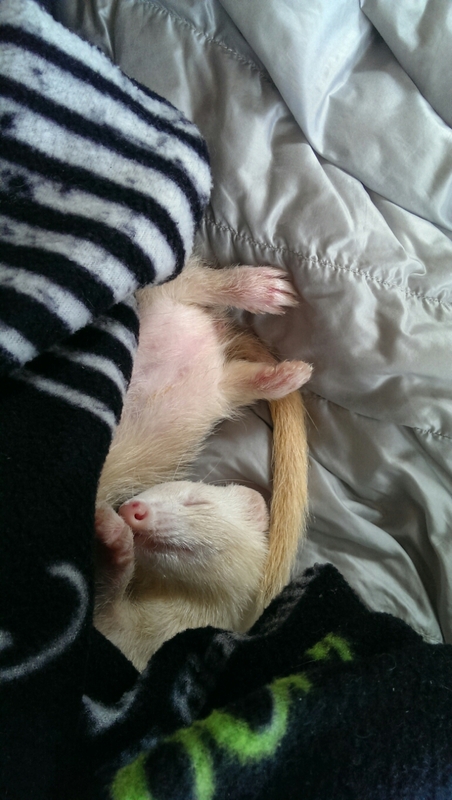 A weasel in a triple soup food coma. The next steps for my weasels are to get them to eat meat off the bone so that I don’t have to cut it. It’s supposedly good for their teeth to gnaw on big chunks, so I’m working up to chicken wings. They also need fur and feathers to replace fiber and bulk up their stools. I bought a pair of unprocessed marmots for that purpose, but when they arrived I had no idea what to do with them. They’re huge! And furry! At this point, however, I am simply pleased that my weasels will accept the food I prepare for them. Their doctor agrees with the diet and I am able to adjust the fat, protein and vitamin content of their food as they age, which is a huge source of comfort to me. I love my little furries and I highly recommend that anyone else who cares for weasels make the effort to incorporate at least a little raw. No amount of convenience can replace the ability to give your small things the nutrition they need, especially when their health starts to decline as my guys’ is. I diagnosed myself with an overgrowth of Candida albicans in September of 2014. I had been fighting with an array of mismatched and otherwise inexplicable symptoms, including adult “non” acne, bipolar like depression, soft stools, and chronic vaginal yeast infections. In addition I required as much as ten hours of sleep on a regular night, and sometimes up to fourteen if I had had a particularly rough day. I had seen doctors for each of these issues separately and was frustrated by how often they would come back saying there was nothing wrong with me. If I don’t have acne, what are all these red bumps all over my face?!? Luckily I’m both stubborn and inherently suspicious of the scientific community. So eventually I landed on candida as a potential explanation for my difficulties. I started a low carb diet, with zero pasta, bread, rice or potatoes, root vegetables only in emergency situations, maximum of half an apple’s worth of fruit in a day, and always mixed with yogurt or in a smoothie so as not to hit my blood stream full force, zero added sugar, massive quantities of active culture yogurt, natto and a daily clove of raw garlic. I quit mushrooms and even laid off soy sauce — in Japan! — for the first two weeks. The result was a two day stretch of carbohydrate withrawal, a two week stretch of mental carbohydrate withdrawal (where anything starchy looked delicious, but my body did not crave it the same way), followed by a steady improvement of my symptoms. In one month my vaginal candida healed. After two months it didn’t come back. After three months my skin was relatively red-bump free and my bowel movements were on the whole generally regular and solid. In the fourth month I relapsed. Proponents of fancy or trendy diets can rave all they want about the “ease” of their diet, how “tasty” the allowed foods are, the health benefits, the moral superiority, but the truth is that in the modern world wheat is king and corn is emperor. It’s nearly impossible to take starchy foods out of your diet and still participate in society. I found myself feeling isolated from my friends because I was the one who couldn’t go out to eat anywhere but a family restaurant (think Denny’s) that would serve a la carte. I had to quit beer and almost all other alcohol, too, which meant people always felt awkward when it was time for drinking parties. On top of that, the world is so fast and full that I think any human would find it a challenge to prepare all of their own meals today, but almost any pre made meal or snack today is just saturated with sugar. I found myself spending whole days feeling hungry and light headed because there was just nothing that I could eat. Naturally, after I was confident that I had things under control, I started to reintroduce small quantities of the forbidden carbs into my diet. That’s when things went awry. It’s hard to know, without writing it all down all the time, how much wheat someone consumes in a day. A sandwich, a cream sauce, a steamed bun — they all have nutrients attached to the wheat part, so it’s hard to think of the wheat as separate from the whole. For example, how much filling needs to be in a sandwich to justify the fact that it’s being put between bread slices? So, I relapsed. 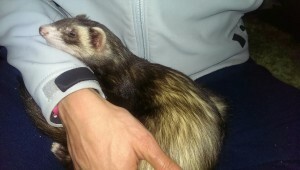 I was under a lot of stress between work and my sick weasel, and I didn’t have the time or energy to go out shopping AND cook. The first sign that things were bad was the poo. Then my skin started to break out again. Finally, back came the crotch rot. I was hoping I could just tough it out until the stressors went away, but no go. I had to go back on my diet and I had to do it immediately. I quit the carbs again four days ago. I cooked with garlic, ate double portions of natto, made my own kefir and chugged it. I’m happy to say that my body is already starting to rebalance itself! The vaginal candida is all but gone (fastest I’ve EVER healed from one of those!) I’ve had a few good poos mixed in with the slushy ones and my skin hasn’t produced any new bumps in a week. It’s frustrating to have to be so strict with myself, but it’s comforting to know that it pays off and that I can be in control of my health. I hope I don’t have to stay on such a strict diet forever, but for the time being I’m just trying to be at peace with the fact that my body had gotten overwhelmed by all the unnatural crap that had been thrown at it since my youth. I’m trying to be kind to my body, and to my spirit, because we are all trying really hard in a very human unfriendly environment. I mentioned in my service section that I think it’s important for people to do service for others. I think it helps the servant to appreciate the things they have as well as their power to effect change. But I’m a big believer in fun, too. So here’s a link to an example of doing service and having fun at the same time. How is this post an example of service? Follow the thread as it develops and you will see people finding happy. Happy, you see, goes viral without any effort beyond finding it for yourself. Then you share it and everyone who reads about your happy will find a little piece of their own happy, too. And it goes from there.